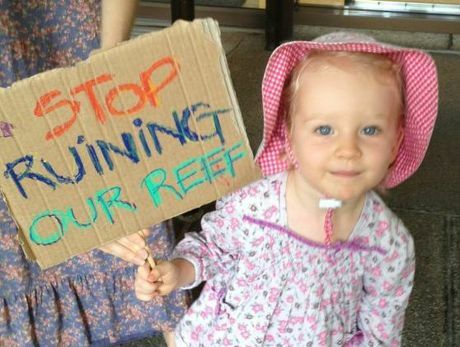 LITTLE Imogen Barker is the very reason hundreds turned out to protest coal ports, increased shipping and other industry practices that might compromise the Great Barrier Reef. 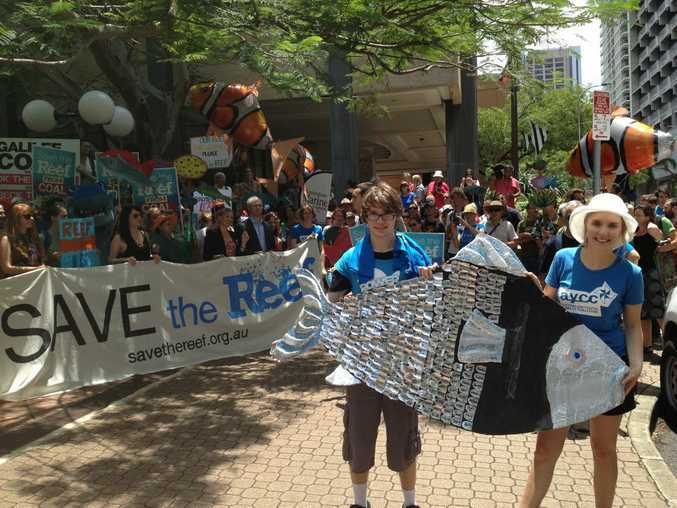 The Gold Coast girl, pictured holding a "stop ruining the reef" sign, helped walk a large signed paper fish to the Queensland Government's executive building as a stark reminder of who would miss out on the World Heritage-listed treasure without adequate protection. People arrived wearing snorkels, marine life costumes and carrying large clownfish balloons for the Save Our Reef protest on Friday. The World Wildlife Fund and the Australian Marine Conservation Society, as part of their joint campaign Fight the Reef, have released a scorecard assessing the federal and state government's response to UNESCO's fears about industrialisation, including port development, shipping and dredging. AMCS campaign director Felicity Wishart told the crowd the governments were "on notice" and "things have to change". Protestors signed an over-sized fish at Save the Great Barrier Reef protest outside the Queensland Government's executive building in Brisbane. She said she feared fast-tracking and special treatment for industry would have dangerous consequences for the reef and both tiers of government were "simply not doing enough. "The sheer size and speed of port and associated development along the reef coast is unprecedented," she said. "Australians love the reef. It's the centrepiece of Queensland's $6 billion dollar reef tourism industry. But this is a wake-up call. 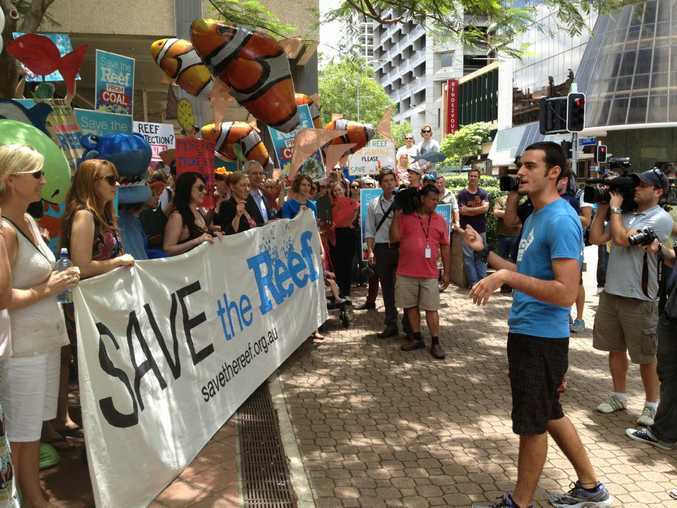 "We've looked at what actions the Queensland Government has been taking and what actions the Federal Government has been taking to protect the reef but it's not good news," she told the crowd in Brisbane. "We've discovered that the Australian Government has not committed to improving the water quality that's flowing onto the reef. "They've not supported a moratorium on new port developments; they're continuing to allow ports and terminals to be approved on the reef. "The Queensland Government has been watering down environmental protections that should be being ramped up to ensure the protection of the reef. "We have a State Government that wants more ports, more dredging, more dumping in the World Heritage area, more shipping going through our world-class marine park. Queensland Greens Senator Larrisa Waters and candidate Adam Stone were among those at the Save the Great Barrier Reef protest outside the Queensland Government's executive building in Brisbane. Louise Mathieson, from Greenpeace, told the crowd they could protect the reef if enough people got behind the campaign. She said the first campaign began in 1968, with a ban on oil and gas mining in the reef by 1975 and then a World Heritage listing in 1981. "A lot of us thought at that stage we could take a seat for a while and relax," she said. "We thought the future of the reef was guaranteed. "So it's pretty heartbreaking for a lot of us to have to get out there and do it all again. "But we've done it before and we can do it again." Ms Mathieson said there were fishermen in Gladstone outraged by what dredging for coal ports was doing for water quality and fish supplies. 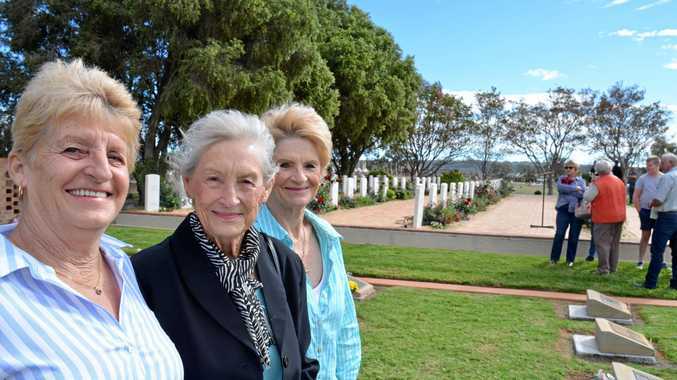 She said farmers inland were battling coal miners which were taking their precious farmland and tourism operators feared they would lose a resource they rely on. "It's bringing together an incredible range of people from all walks of life right across the country," she said. Ms Mathieson announced Greenpeace's flagship the Rainbow Warrior will visit Queensland this April, sailing along the GBR coast for a month. Australian Greens Senator Larissa Waters said her party would move amendments to federal environmental laws to enforce the recommendations and protect the reef. She said the government should not ignore UNESCO's recommendations by favouring short-term private profits for the coal and gas industry. "The Australian Government deserves a fail mark on their reef homework," she said. "They have not put a moratorium on new coal or gas port approvals, they have approved Abbott Point coal terminal expansion, and the belated panel to investigate the Gladstone Harbour environmental disaster is not required to use independent data. "The minister simply says he will apply the law to the rash of new coal and gas port applications but those same weak laws have already failed the reef by allowing 68 million cubic metres of dredging in the past decade, with another 58 million cubic metres now applied for - 74 Melbourne Cricket Grounds worth in total. "The Greens will not stand by and let the government permit the coal and gas industries destroy our Great Barrier Reef."